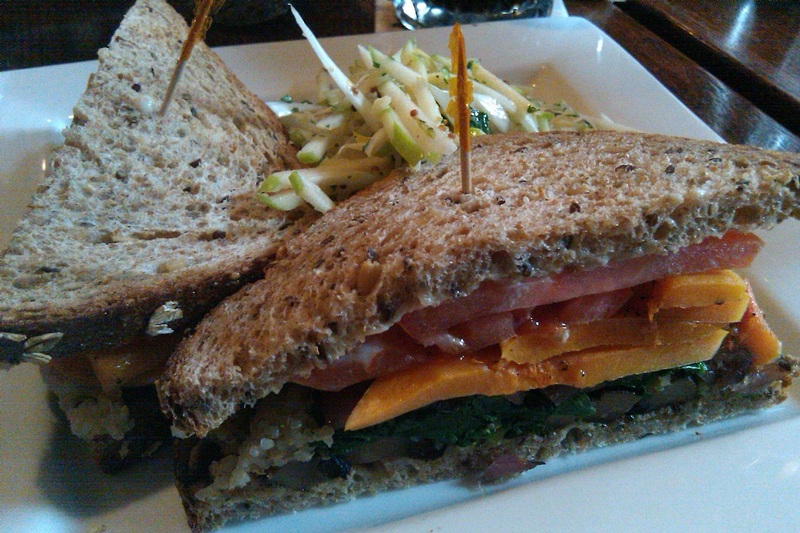 Skinner’s Loft put forth a mushroom sandwich, and I was all too happy to receive it. This is a sandwich that aims high: Roasted portobello mushrooms join butternut squash, grilled red onion, quinoa, spinach, tomatoes, and parmesan fondue all on 7-grain bread. It’s a fair number of ingredients, and some of them seem unnecessary at first glance. But whoever is responsible for this wonder has a skilled hand, and those ingredients come together in a very well balanced harmony. The mushroom and the squash are the stars, of course, and their textures contrast each other perfectly. The tomato and grilled onion bring a sweet note to things, the spinach a contrasting earthiness that echos the mushrooms, and the quinoa and parmesan fondue fill any gaps with a delicious smoothness. Looking at it now and thinking back I only grow more impressed. For nearly every sandwich I eat there is some thought that occurs to me about how it might be made better, but I can think of nothing that would improve this. Every angle is considered, every element properly served. This was a great, great sandwich. This entry was posted in Sandwich Reviews and tagged Mushroom, Reviews by Pete, Sandwiches I Have Eaten, Vegetarian by Pete. Bookmark the permalink. This sounds really good. It’s nice to see a vegetarian sandwich that isn’t a half pound of cream cheese and piles of sprouts. The squash sounds unique and interesting. I’ve never heard of quinoa on a sandwich, but now I must try it. It was a new idea to me as well, and as you read I thought it was quite the success. Here’s my prescription for you: A couple thick slices of whole wheat bread, a healthy schmear of quinoa, onto which you pile leafy greens, fresh red peppers, and bacon, extra crispy.